Welcome Residents, Guests & Visitors! For more than one hundred and twenty-five years, summer residents of the Village of Sturgeon Point have gathered for Sunday worship in this striking place. The site has been the heart of our village community since the original structure was erected in 1888. That building was replaced in 1915 with the church we enjoy today, celebrating one hundred years of service in 2015. Mrs J.W. Flavelle (Clara Ellsworth and, later, Lady Flavelle) commissioned Toronto architect A. Frank Wickson to build an octagonal church, based on the design of a chapel in Athens, Georgia that she had admired. Though the Flavelles were committed Methodists, the project was for the building of an ‘independent’ church. The new Sturgeon Point Union Church was presented to the village on July 11, 1915, in a service attended by cottagers and Lindsay residents, many of whom made the trip on the steamer, Lintonia. 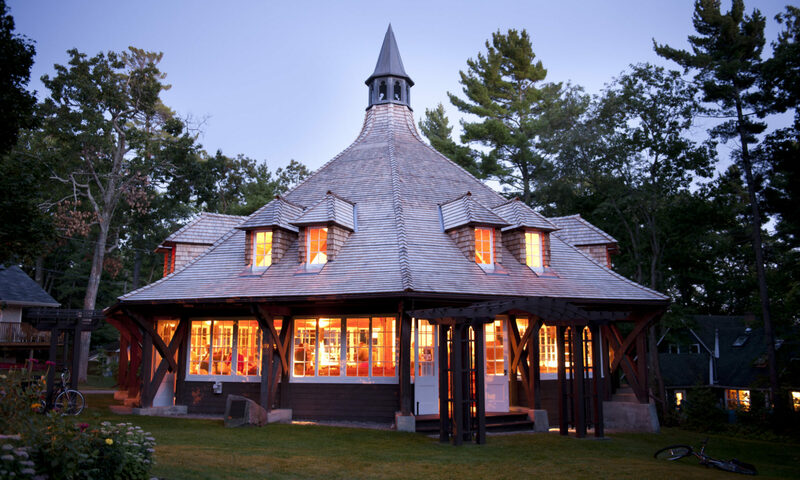 The eight-sided church is constructed of southern yellow pine. It has windows on seven sides and is supported by a central pillar from which beams branch out to meet the sloping ceiling. From the roof, dormer windows admit additional light and, above them, a belfry houses the bell which calls villagers to Sunday services. Three sections of pews separated by two aisles face the pulpit, choir seats and organ. Behind these, a small vestry and anteroom complete the building. Over the years the church’s welcoming arbours, a baptismal font, a fine organ and pulpit have been added, all memorial gifts from congregants. The church has remained independent, welcoming worshipers of all creeds. It is administered by a board of trustees and a committee elected at an annual congregational meeting. It is supported solely by free-will offerings, and welcomes the aid of all who wish to help it continue its mission of worship and community outreach. The church supports a number of local charities based beyond the boundaries of our small village, and has a strong tradition of engagement in many of the region’s worthy causes. Another longstanding Sturgeon Point tradition is the welcoming of visiting pastors. Every summer Sunday a different cleric takes the pulpit. They bring the traditions of their creed and the experiences of their own community, in this way enriching ours.